Cuvee du Vatican Sixtine has been making wine in the Southern Rhone Valley for about as long as their vines have been growing. And that’s over 100 years! However, the family has been in Chateauneuf du Pape for even longer. The Diffonty family has roots dating back to the 17th century. Prior to making the land was devoted to planting various fruits, vegetables and olives. Things changed for Cuvee du Vatican at the start of the 20th century. In 1902, Cuvee du Vatican produced, bottled and sold their first vintage. Prior to that date, their harvests were sold in bulk to negociants. 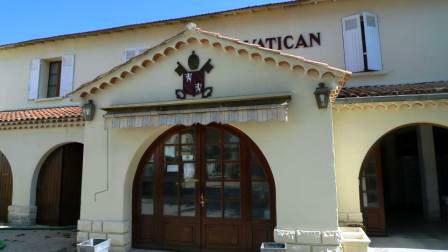 Cuvee du Vatican became more focused on their winery when they began bottling their wines at the domaine in 1952. Three years later, they opened tasting room. Felicien Diffonty, who had been managing Cuvee du Vatican since 1945 was succeeded by his son Jean Marc Diffonty and his wife Karine Diffonty in 1992. The wine changed for the better in 2001 when they began to complete destem their grapes in 2001. The wine at Cuvee du Vatican is aged in a combination of foudres and old, small oak barrels. In 1998, Cuvee du Vatican began producing the popular, Reserve Sixtine wine from some of their oldest vines. It’s usually a blend of mostly Grenache with Syrah and 15% Mourvedre. In 2010 the Diffonty family shook things up at the estate by changing the estate’s name and marketing plans. Previously known as Cuvee du Vatican, the top wine was Sixtine. In 2010, the estate was officially renamed Sixtine, to compliment their top wine. They also produce a second wine, Manus Dei. On a going forward basis, they produce and sell a third wine, a negociant blend which maintains the original name of the estate, Cuvee du Vatican. The 22.4 hectare vineyards of Sixtine, located in Chateauneuf du Pape are a patchwork of parcels with a myriad of different terroirs. You find some vines planted in sand, loam, limestone and stones of various sizes in their soil. They have old vines. Their oldest Grenache vines date back to 1905, those are planted in the La Crau sector. 21 hectares are devoted to making red wine and 1.4 hectares are used for the production of white Chateauneuf du Pape wine. The best vintages of Cuvee du Vatican Sixtine are: 2018, 2017, 2016, 2015, 2012, 2010, 2009, 2007, 2005 and 2001. Cuvee du Vatican Sixtine produces 2 red Chateauneuf du Pape wines and 2 white Chateauneuf du Pape wines. Cuvee du Vatican Chateauneuf du Pape is a blend of 75% Grenache, 15% Syrah, 5% Mourvedre, 5% Cinsault and assorted other grape varieties. The vines are planted in the Barbe d’Asne, Bois Lauzon, la Crau, Crista and le Pointu, lieu-dits. The terroirs is rocks with sand and clay soil. The vines are on average 45 years of age. The wine is aged in foudres for 12 months. On average, the production is 3,750 cases per year. Cuvee du Vatican Sixtine is a blend of 55% Grenache, 30% Syrah and 15% Mourvedre. The vines for this wine range in age from 50 to more than 100 years of age. Here you find terroirs of rocks, sand and clay soils in the Barbe d’Asne, Bois Lauzon, La Crau, Crista, le Pointu, and les Roumiguieres lieux-dits. The wine is aged in a combination of new and used, French oak barrels, demi-muids and tank. Close to 60% of the production is aged in the new oak barrels. 2,000 cases are produced each year. Even though this is a modern styled wine, there is so much ripe fruit, the oak is not really present. Cuvee du Vatican Sixtine is an outstanding Chateauneuf du Pape wine that sells for fair price for it’s quality. Cuvee du Vatican Chateauneuf du Pape Blanc is made from a blend of 50% Clairette, 20% Grenache Blanc, 20% Bourboulenc and 10% Roussanne. The wine is aged in 33% new, French oak barrels and 67% in vat for 9 months. The production is 225 cases per vintage. Cuvee du Vatican Reserve Sixtine Blanc is a blend of 70% Roussanne and 30% Clairette, aged in new, French oak barrels for 9 months. On average, only 175 cases are produced each year. Cuvee du Vatican Sixtine can be enjoyed on the young side. 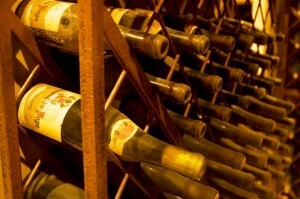 Young vintages can be decanted for about 1 – 2 hours, give or take. This allows the wine to soften and open its perfume. Older vintages might need very little decanting, just enough to remove the sediment. Cuvee du Vatican Sixtine is usually better with 4-6 years of bottle age. Of course that can vary slightly, depending on the vintage. In the best vintages the wine should be consumed within 5-20 years after the vintage. Cuvee du Vatican Sixtine is best served at 15.5 degrees Celsius, 60 degrees Fahrenheit. The cool, almost cellar temperature gives the wine more freshness and lift. Cuvee du Vatican Sixtine is best served with all types of classic meat dishes, veal, pork, beef, lamb, duck, game, roast chicken, roasted, braised, stewed dishes, barbecue, sausage and cassoulet. Cuvee du Vatican Sixtine is also good with Asian dishes, hearty fish courses like tuna, mushrooms pasta, eggplant, tomatoes and cheese. The white wine of Cuvee du Vatican Sixtine is best served with a myriad of different seafood dishes, shellfish, crab, lobster, sushi, sashimi, chicken, pork and veal, as well as Asian cuisine. The Sixtine estate and the Diffonty family also own 17 hectares of vines in the Southern Rhone Valley that are not classified. Medium bodied, with a salty accent to the garrigue dusted, crisp, red fruits. This should drink well young. The wine is made using 65% Grenache, 25% Syrah and 10% Mourvedre. Medium bodied, forward and perfect for early drinking pleasure, the fruit is soft, with sweetness and herbs in the finish. Medium bodied, correct, forward, clean and focused on fresh, red fruits and spice for early drinking. Medium bodied, forward, correct red berry dominated wine for uncomplicated drinking. Spicy and fresh, the kirsch flavors show off its essence of Grenache. Easy drinking and forward in style, enjoy this, bright, red berry focused wine young. Earthy, forest floor, kirsch, animal and smoked meat aromas get you interested in the wine. Soft, round and chewy, the wine ends with ripe, black cherries. This is a screaming value! Earthy, forest floor, kirsch, animal and smoked meat aromas get you interested in the wine. Soft, round and chewy, the wine ends with ripe, black cherries. Forward and open, with just a hint of oak in the nose, the wine is plush, juicy, ripe and round, with lots of sweet black and dark red fruits, licorice and herbs. Drink now for pleasure. Age it for complexity. Served blind, popped and poured, scents of licorice, jammy plums, truffle, earth and kirsch were in full force. Concentrated, rich and full bodied, there was a touch of heat in the finish. Vatican Sixtine remains one of my Chateauneuf du Papes. Who can complain when a winery blends fair prices with good quality? This big, powerful, rich, ripe wine is filled with dark jammy berries, fresh cracked pepper, raspberries, earthy aromas, supple textures and a long finish. Tight, bright and not nearly as much fun to taste as the 2007, which were both served blind. This is a nice Chateauneuf du Pape, but for my palate, it would be hard to get excited about it. Deep in color, with licorice, blackberry, earth, spice and garrigue, the wine felt rich with its round, open style. I imagine it will only get better over the next few years. Modern in style and a lot of fun to taste. It's still a bit oaky, which is not something I really want in a Chateauneuf du Pape, especially one that is 10 years or older, but there is so much, ripe, sweet, lush kirsch, spice and freshly cracked black pepper, which is all made better with its round, plush textures, I can forgive it. I am not sure this is going to get better, but it's really fine today. Produced from incredibly low yields ranging from 17 to 25 hectoliters per hectare, this rich, intense, powerful, plush style of Chateauneuf du Pape remains deeply colored. With a nose packed with fennel, jammy blackberry, blue fruit, pepper, herbs, spice, griotte and smoke, the wine slides from the glass, filling your palate with pleasure. It's big, rich and packed, yet everything is in balance. There is no sensation of heat from the 15.7% alcohol. Vatican Sixtine remains one of the best values in a world of increasing prices. I'd drink this over the next 5 years to preserve its freshness and fruit. Black pepper, plums, dark cherries, jammy black raspberries and kirsch aromas make way for a concentrated, rich, mouthful of ripe Grenache. This is drinking great today. Fully mature, with an earthy, peppery, garrigue, truffle and kirsch nose, the wine is full bodied, fleshy, long and ready for prime time drinking. The wine was made from a blend of 50% Grenache, 30% Syrah and 20% Mourvedre, which explains its longevity. Tart red fruit is the name of the game here. The wine is crisp and sharp, with biting acidity. Better on the nose than on the palate, this requires consumption.